Just 15 minutes’ walk from Saint-Pierre town centre, this B&B in Saint-Pierre and Miquelon offers a non-smoking environment. Free Wi-Fi is available in all rooms. Featuring hardwood floors, rooms at Pension Bed & Breakfast Dodeman come complete with cable TV. A shared bathroom is accessible to guests. Breakfast is served daily at Pension B&B Dodeman. A common living area is equipped with a TV. Saint Pierre’s shopping centre is 10 minutes’ walk away. Musée Heritage museum is about 1.5 km away. L'Auberge Saint-Pierre is a family-run guest house located a 5-minute walk from the centre of Saint-Pierre. 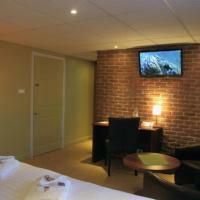 It offers free Wi-Fi, free continental breakfast and functional rooms with flat-screen cable TV. Each bright modern room at L'Auberge Saint-Pierre features a desk and a telephone. The private bathrooms include a shower, free toiletries and a hairdryer. The buffet-style continental breakfast includes typical French pastries and cakes. Between 1 October and 1 April, dinner is available at an extra cost. Picnics can also be prepared on request. Shops, restaurants and fast food outlets can be found within a 10-minute walk, while the seafront and Heritage Museum are around 800 metres away. L'Auberge Saint-Pierre can arrange tours of Saint Pierre and visits to Miquelon and l'Ile aux Marins.